Mould is a common problem in homes throughout the UK. Caused by the damp British climate, not only does it look unsightly, it also poses a serious health risk if left untreated for too long. So, don’t delay, find out how to treat your mould problem today. Fuze MoGo is a highly effective product that contains a unique blend of biodegrable, non-hazardous materials. Fuze MoGo is completely bleach-free, making it safe to use on virtually any surface. Spray Fuze MoGo directly onto the area you need to treat. You should aim to apply roughly 200mls per square metre. Using a stiff-bristled brush, scrub the treated area until clean. 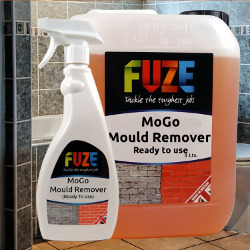 The powerful cleaning agents in Fuze MoGo will remove all traces of mould. Once you’ve dealt with the mould infestation, you need to prevent it from returning. Keep bathrooms, kitchens, and other humid spaces well ventilated and as dry as possible. If you don’t keep the moisture to a minimum mould can return. Spread out shower curtains and towels to allow them to dry.